From the late 1990s to mid-2000s, a small but dedicated group of civil society and indigenous peoples’ organisations focused on documenting ICCAs in several countries and regions and promoting their recognition at the international level – particularly in biodiversity law and conservation policy. Since then, ICCAs have been recognised in a wide range of decisions of the UN Convention on Biological Diversity (CBD) and policies and programmes of the International Union for Conservation of Nature (IUCN). 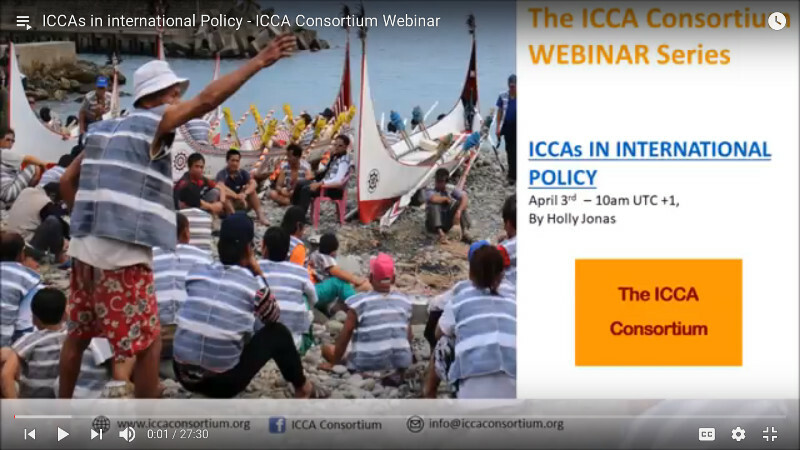 At least since the mid-2000s, ICCA advocates shifted to a more explicitly human rights-based approach and began promoting ‘appropriate’ forms of recognition and support – particularly those initiated, defined and led by peoples and communities themselves. These and other efforts primarily focus on securing positive and proactive recognition for ICCAs’ contributions to the conservation of nature. They also aim to support ICCA custodians to secure the integrity of their territories and areas and the cultural systems that sustain community wellbeing. However, ICCAs and their custodians also face myriad external threats, including from large-scale natural resource industries (such as fisheries, monoculture plantations and mining), energy and infrastructure projects, military installations, exclusionary protected areas, tourism, and top-down ‘development aid’ schemes. These threats contribute to and are further exacerbated by global environmental changes such as biodiversity loss, climate change, extreme weather events, and ocean acidification and coral bleaching. ICCA advocates are also striving to defend against such threats, including through international policies and laws that protect human rights and provide access to remedy for past and ongoing injustices. Advocacy efforts at the international level are closely related to the development of national ICCA networks, coalitions and federations as a means to mobilise and advocate for national recognition and support. Explore below the specific topics and areas where the Consortium has focused advocacy for appropriate change in policy and practice.